Many of us have been dreaming about sailing on the sea on a beautiful day and of enjoying the silence and peace. On the sea you can forget about everything and enjoy the romance of the sea. We offer you a relaxing sailing trip on the comfortable and safe sailing boat "P�hjat�ht". 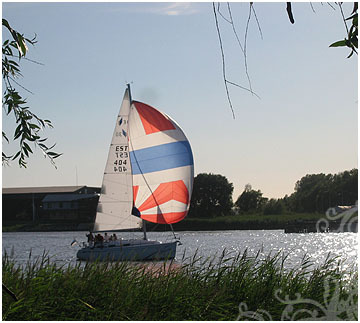 The yacht is 10 m long, 3,5 m wide and has a draught of 1,9m The sailing boat is produced in Germany in 2005 by Bavaria Gmbh. a toilet; heating in all cabins; audio and TV equipment; a shower on the deck. There is enough space for an enjoyable cruise for 10 persons, sleeping possibilities for 6 persons. The yacht is also equipped with all internationally required safety- and navigation devices. Your captains are Teet and Tanel from P�rnu Yacht Club. We organize sailing trips according to customer's wishes to the Gulf of P�rnu or to the closest small islands in the Gulf. So, bring along your picnic basket and friends, and come enjoy the sunny sea! Or bring your date and enjoy the sunset on the bay! You can also bring along your business partners or family and combine a sailing trip with an unforgettable visit of the authentic Kihnu Island which belongs to the UNESCO World Heritage List! Why not organize a training for your colleagues on the sea? Give us a call and we will tailor you an offer according to your wishes.